DO40 Legacy Award Honoree Gene Gavin never got to accept his award in December, 2015. He died unexpectedly from a fall in his apartment in October. But his three nephews came to accept the award, and were thrilled by the love and warmth shared by the audience to them – and of course, to Gene. Well, it looks like Gene WILL have the last word! Gene, a contributing writer to our Newsletter, kept a diary! And nephew Richard Tuttle found it – and it is being published by Glendale Press in September! Matter of fact, a portion of Gene’s book about Jerome Robbins will be read at our West Side Story event September 27th!! 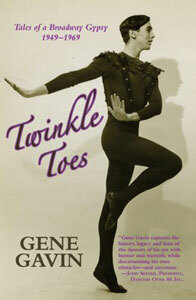 Gene danced in the original West Side Story, Shinbone Alley, Sail Away, Skyscraper, Litte Me, How to Succeed, Walking Happy, Bravo Giovanni and Ballets USA. He toured Europe and Japan with the New York City Ballet as well. DO40 will announce when the book is ready for sale. Are there guardian angels for books? It would ap-pear so, because according to author Lisa Jo Sagolla, this book found her. She was guided from point to point to write this compelling and compre-hensive biography of Joan McCracken. Initially asked to prepare an entry about McCracken for the American National Biography, Lisa Jo thought that that would be the end of it, but there followed one discovery and coincidence after another, and finally Sagolla concluded this biography was "meant to be." Joan McCracken, as many DO40 members know, was a Broadway star of her day, with an illustrious career and a little foray into movies (lighting up the screen alongside June Allyson and Peter Lawford in "Good News," for example). She started the choreographic career of her then husband, Bob Fosse, who regarded her as the biggest influence of his life. She was a longtime friend of Truman Capote and one of the models for the character of Holly Golightly. She was a Broadway star and a favorite de Mille dancer, creating roles in Oklahoma!, Bloomer Girl, and other shows. Sagolla's research was extensive, and a happy blend of hard work and kismet. A story in Dance Magazine about Bob Fosse, written by DO40 member Margery Beddow, drew a response letter from Irene Silverman, who remarked that she had known Joan McCracken. Lisa Jo followed up and met many times with Ms. Silverman, who tragically was murdered by Sante and Kenneth Kimes. Other fortuitous coincidences dotted the way all along. McCracken and Lisa Jo are both from the Philly area and both are Capricorns. Lisa Jo, by chance, handed in her completed book on October 31, the same day that Joan McCracken died in her sleep of a heart attack. And when the book was done, Lisa Jo was forty-three years old, the same young age as Mc-Cracken when she died. A major achievement for Sagolla, currently a dance teacher at Marymount Manhattan College and Columbia University, and a dance critic for Backstage. Hal Prince called the book "a fascinating chronicle of McCracken's journey, not only as an artist but what is perhaps even more interesting, as a human being." Finally, we can dream, can't we? 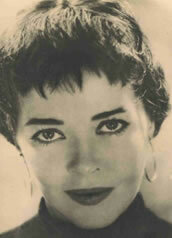 If Hollywood should call to turn the book into a movie, who could play Joan McCracken? Who could play Bob Fosse? Any ideas? This book is a collection of rare photographs and personally written experiences by individual artists. Only about 50 re-printed second editions remain. Danilova, Balanchine, Patricia Wilde, and Mia Slavenska are just a few of the people featured. Also included are corps de ballets dancers who describe their personal experiences during their travels to cities small and large, bringing dance to people that had never seen dance before.